Today, I would like to take a look at creating your first ASP.NET application, using TX Text Control Server for ASP.NET (incl. Windows Forms). I am going to show you how - with just a few lines of code - you can generate a document and export it to an Adobe PDF document. I suggest that you take a look at the source code as you go along. Templates and databases are centralized, thus all end users are working on the same basis and are up to date anytime and everywhere. Server side applications are accessible via a web browser interface, so that end users have access to the most important documents anywhere in the world. Documents generated by centralize templates have the same look and feel, thus reinforcing the branding message of an enterprise. Not every single document must be saved individually, but can be created on demand, thus saving valuable storage space. First of all, before we can start, we need to ensure that you have Internet Information Server (IIS) installed on your development server or on your local machine. Both are valid development environments: Commonly developers develop and test on their local machines and move their finished applications to a production server at a later stage. TX Text Control Server for ASP.NET (incl. Windows Forms) supports IIS, version 5 or higher, running on Windows 2000, Windows XP or Windows Server 2003. Assuming that you have already run the TX Text Control Server for ASP.NET (incl. Windows Forms) installation program, start Visual Studio .NET and create a new project. 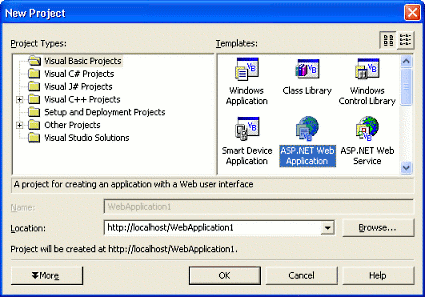 Select either Visual Basic .NET or C# .NET as a project type, and ASP.NET Web Application as a template. in the new project. In the Customize Toolbox dialog box, select the .NET Framework Components tab and then click the Browse button. 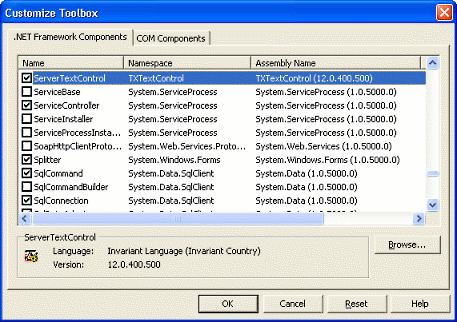 After closing the dialog box, you will see an additional icon appear at the bottom of the Components Toolbox, representing TX Text Control Server for ASP.NET (incl. Windows Forms). In the next step, we are going to insert some simple code to set the text of TX Text Control Server for ASP.NET (incl. Windows Forms) and to export the resulting document as an Adobe PDF file. ServerTextControl1.Text = "TX Text Control Server for ASP.NET (incl. 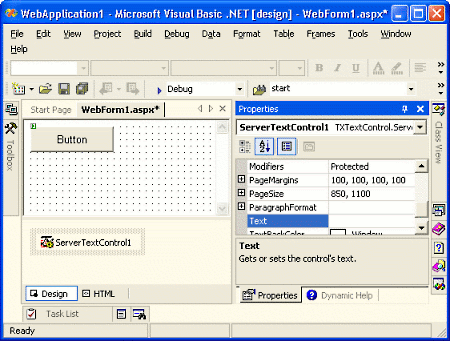 Windows Forms)"
The Create and the Dispose method must be called before and after using TX Text Control Server for ASP.NET (incl. Windows Forms) to initialize and dispose the component. The Save method of TX Text Control Server for ASP.NET (incl. Windows Forms) is used to save the content to a byte array. This array is returned to the browser using the Response.BinaryWrite method. Press F5 to compile and start the application. After clicking the button, TX Text Control Server for ASP.NET (incl. Windows Forms) creates the document and the returned PDF document is opened in the default external Adobe PDF viewer.